Here’s some advice. If you haven’t gotten a flu shot, get one. The 2017-2018 flu season is turning out to be a real monster, and it isn’t close to over yet. In fact, we’re only about halfway through the season. In general, flu season starts getting worse in October, then peaks between December and February. 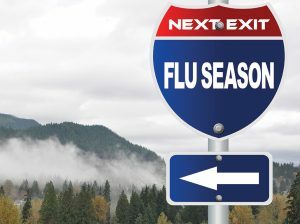 The latest data show this year’s season has not yet peaked, and many more weeks of serious flu activity are expected. One of things making this flu season so harsh is that the main bug in this year’s viral combination is the particularly nasty H3N2 influenza A strain. This year, it’s combined with another influenza A virus and two influenza B viruses. The H3N2 is known to cause serious seasonal flu epidemics. H3N2 is the most dangerous of the flu strains this flu season. According to Daniel Jernigan of the US Centers for Disease Control and Prevention, “Of the viruses we hate, we hate H3N2 more than the other ones.” They hate it because it’s able to adapt rapidly in order to evade the efforts of the immune system, the body’s natural germ-fighting force. This year’s flu season is one of the worst in years. The CDC reports that as of the beginning of February, infection rates were higher this year than any year since the swine flu hit in 2009. In addition, the number of people being admitted to hospitals due to the flu is the highest they’ve ever recorded at this point in a season. Currently, there have been more people admitted to hospitals than were admitted during what was a horrendous flu season in 2014-2015. That year, 710,000 Americans went to the hospital, and 56,000 people lost their lives as a complication of the flu. Many people are being hospitalized, but what about those who don’t get that bad. The CDC releases statistics on the flu weekly. The most recent report indicated the percentage of people going to their doctors with flu symptoms is 7.1 percent. That’s an increase over the previous week, which was 6.5 percent. Flu symptoms can be different in each person, but there are a few symptoms that are pretty common signals you’ve got the bug. These include fever, chills, cough, sore throat, body/muscle aches, headaches and fatigue. Some people may get diarrhea or start vomiting. For most, otherwise healthy people, the virus will run its course in a few days without treatment other than managing the symptoms. For others, especially the elderly, young children, pregnant women and people with chronic diseases such as diabetes and heart or lung disease, the flu can be a serious proposition requiring treatment with anti-viral medications. This year, Baby Boomers are getting hit hard by the flu, but health officials aren’t sure why. As of February 5, the CDC rated the flu as widespread in 48 states. Hawaii and Oregon were the only states reporting activity that rated lower than the widespread designation. Also, as of that date, 53 children have died from the flu. It’s not been reported how many adult deaths there have been thus far. Flu kills by compromising the immune system or using it against you. When a virus enters the body, the immune system sends out special cells to find and kill it. Inflammation occurs as part of this process, but inflammation can keep oxygen from reaching the tissues in the organs. In the lungs, it can affect the blood vessels where oxygen transfer is done, leading to pneumonia. That can be deadly in anyone, but especially in older adults and those with heart or lung disease. The flu can kill in other ways, too. If inflammation affects several organs, it can lead to body-wide inflammation, or sepsis, which can cause multiple organ failure and death. In addition, the energy needed for the initial reaction to battle the virus takes a toll on and weakens the immune system. This makes the body more susceptible to other infections that can lead to death. Prevention is your best weapon against the flu, and that includes getting a flu shot. You may think it’s too late or think this year’s flu shot won’t protect you, but do it anyway. Remember, we’ve still got a long way to go before this flu season is over, so don’t put off getting the flu vaccine any longer. The H3N2 strain tends to be resistant to vaccines, but health officials don’t know how effective this year’s vaccine is against this year’s version of the bug. They won’t know until the flu stops spreading. Keep in mind, though, there are also the three other strains of viruses in this season’s combination. They can also make you sick, and the flu shot protects you against those, as well. It doesn’t guarantee you won’t get sick, but it helps. There are a few additional things you can do to help prevent the flu or stop the spread of it. One of the most important is to wash your hands frequently and thoroughly. And if you do have symptoms, stay put at home. Don’t go out, and stay home from work or school to keep from giving the virus to someone else. Also, clean surfaces you touch regularly. This includes common things like doorknobs and the TV remote, especially if you stay home and park in front of the TV while you’re sick. Keep your tooth brush separated from those of the other people in your house, and wash the sheets and blankets on your bed frequently. Your best bet against this virus? Use common sense – and get a flu shot.